Ethiopia has been a a growing market in the coffee bean business, putting forth many Ethiopian coffee brands. The most productive and popular brands of Ethiopian coffee beans are grown in four primary regions. Ethiopia as a country has decided to market each region as a separate product. The result is that the regional names are becoming more recognizable than the country for their specific coffee bean characteristics. Do You Want the BEST Ethiopian Coffee Brand? These four regions of Ethiopia are the primary coffee bean growing regions. I personally see Yirgacheffe coffee beans everywhere when looking for Ethiopian coffee brands. I see them on coffee bean forums, in grocery stores, talking to friends, etc. So, while researching Ethiopian coffee beans for this article, I estimate that I see Yirgacheffe as a brand more often than three region brands combined. Harrar is located in central Ethiopia towards the eastern borders. Sometimes it is spelled Harrar, Harari, Harer, or Harar. One of the more known coffee bean varieties is Moka Harrar. One of the more unique characteristics of Harrar is the old City Wall of Harrar that was built between the 13th and 16th centuries. The city of Harrar is considered to be the fourth oldest city in the region behind Mecca, Medina and Jerusalem. Harrar has been a strong Muslim city for centuries. Many early leaders of Harrar were proponents of Jihad and attempted to snuff out Christian cities in the region. Even though Harrer has strong Muslim heritage, most of Ethiopia has a strong Christian culture. Coffee beans from Harrar are often laid out to dry in the sun, fruit and all. This causes the fruit to bake the coffee beans leaving a wild, somewhat fruity and overly sweet taste. 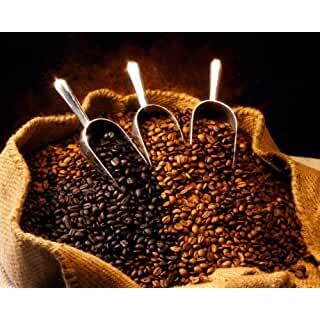 Coffee beans that are left to dry for longer periods of time end up having a mild fermented aftertaste. The farmers of Harrar like to market this taste as a “mocha” flavor. Although, many in the coffee world find this a very misleading description. Many describe Harrar coffee beans as being distinctively fruity, with a wine-like flavor. In Limu Ethiopia, coffee beans that are harvested are then washed or what is called wet processing. Wet processing involves soaking the coffee bean fruit in water for long enough to soften the fruit layer of the coffee bean. The softened fruit is then processed using a pulping machine to shuck the coffee beans from the coffee bean cherry. Once separated from the cherry, the cherry seeds (the coffee beans) are often places in a separate fermentation tank for 8 to 24 hours. The purpose of the fermentation tank is to remove the mucilage or glue like substance that encases the coffee bean seeds inside the coffee cherry fruit. After the coffee beans have been completely separated from the cherry fruit, they are typically sun dried or machine dried. The coffee beans used in the “Limu” wet process are hand selected and end up being higher quality. The Limu coffee beans are typically soft from the wet processing. Limu coffee plants produce a round bean. The taste is almost flowery with hints of citrus. But, the Limu coffee bean ends up less fragrant than its counterparts from other regions in Ethiopia. The southern region of Ethiopia hosts a multitude of coffee bean plantations. Being from the Sidamo region, these coffee beans have their own distinct flavor. The farmers in Sidamo also typically follow similar washing procedures as is performed in Limu. Sidamo coffee beans are Arabica. In fact, Ethiopia is often considered the place where all Arabica coffee beans were born. Sidamo can lay a significant claim as the source of all coffee! 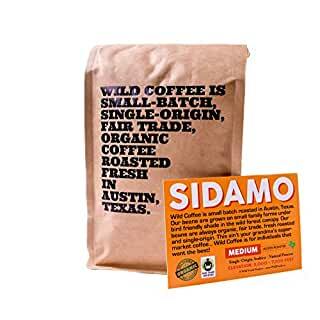 Sidamo coffee beans provide a rich, deep flavor with hints of spice and wine. Sometimes a chocolate-like note can be identified. And, the aroma found is very flowery. Yirgacheffe is sometimes spelled Irgachefe, Yirgachefe, Yergacheffe, or Yerga Chefe. We are going with Yirgacheffe because most coffee bean brands have chosen this spelling in their brand name. Also, Google asks if you meant “Did you mean: Yirgacheffe” if you type any of the other spellings into the search engine. Location-wise, Yirgacheffe is deep within the Sidamo region. So, if Sidamo is the heartland of Arabica coffee beans, Yirgacheffe should be considered the heart. Yirgacheffe coffee beans are grown at an elevation of just a little over 6,000 feet. The high quality of these Yirgacheffe coffee beans caused others looking to capitalize on this farming recipe to look for similar elevations. Many exported Arabica to these other location (many in South America) in search for similar success. They were very successful with this strategy. Wet processing is also one of the hallmarks of Yirgacheffe Ethiopian coffee brands. The “washing” gives these coffee beans a “cleanness” and “crispness” that you often don’t find in other coffee bean brands. Now that we’ve talked about the top coffee bean growing regions and some of the characteristics of each, we reveal our findings for the best Ethiopian coffee brands from each region. Our research led us to this Harrar coffee bean as the top coffee bean product using the “Harrar” brand name. Koffee Kult has been a consistent player in the coffee bean business. So, it is no surprise that they also excel in the Ethiopian market. This Harrar coffee bean can be described as having blueberry notes, with smooth dark chocolate undertones. Its body is considered balanced or sometimes full. These beans are considered “medium” roasted by Koffee Kult. Many describe these “medium” beans to be towards the darker side of “medium”. 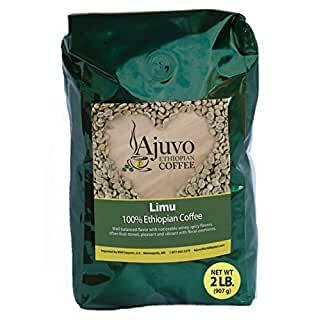 For the best Limu Ethiopian coffee brands, we selected this gourmet product from Ajuvo World Market. Ajuvo describes these Limu beans as having a winey-spicy flavor with a fruit-toned aroma. They participate in Fair Trade with the Oromo Coffee Farmers Cooperative Union. The fruity and spicy undertones of this coffee bean occur because these coffee beans are grown next to bananas, cinnamon and tea plantations. This unique growing experience gives these Limu coffee beans an extraordinary taste that can only be described as gourmet. With Yirgacheffe being part of Sidamo, it was a little difficult finding “Sidamo” Ethiopian coffee brands that weren’t from Yirgacheffe. 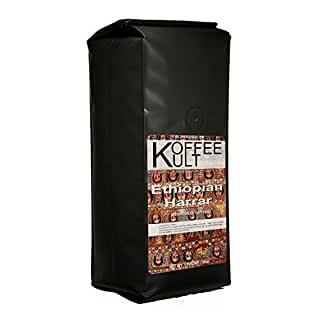 But, we think of all the Sidamo Ethiopian coffee brands, this one from Wild Foods hits all of the markers your looking for in a top notch coffee bean. Wild Foods is a small company that imports coffee beans from Ethiopia and roasts them in their own back yard in Austin, Texas. They adhere to fair trade practices and are Fair Trade certified. The buy from Ethiopian farmers that grow their beans organically. Wild Foods calls these coffee beans a “medium” roast. You might find these beans to be on the “darker” side of medium. From a taste perspective, it has a deep rich body. And, you can definitely sense notes of chocolate, with floral hints and a touch of spice. We had to go with wet processed for the best Yirgacheffe coffee bean brand. And, this coffee bean from RhoadesRoast Coffees met all of the criteria. If you want a crisp clean taste, then Yirgacheffe is the coffee bean for you. Washed in this case means wet processed like we discussed above. This process is what gives these beans such a clean flavor. If you roast these beans to a medium or even City roast, you’ll get a smooth medium body. This results in a very nice finish. Several customers bragged about roasting these beans to a medium to dark roast, and how well these beans worked when prepared as espresso. These beans provide a low acidic mixture with a high caffeine kick! However, I don’t sell coffee beans by the ton. If you click on the various coffee bean I recommend, they will take you to a page that shows you the price. Let me know if you have any problems with that. Thank you! I’d love to hear any great coffee bean experiences you’ve had.